This style is waterproof and comes with a removable footbed that changes a medium to a wide. • A trimmer, dressier profile built with XC4 waterproof extreme-comfort technology. • Full-grain waterproof leather upper with seam-sealed construction. • Advanced construction reduces overall weight, optimizes flexibility. 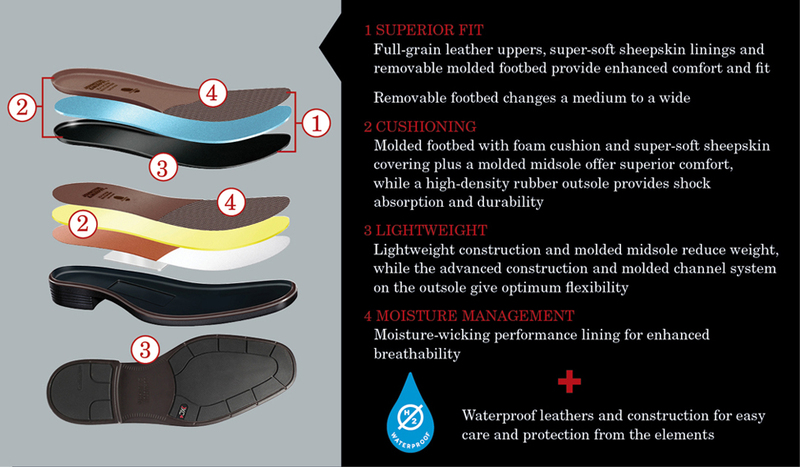 • Molded footbed and midsole for support. • Removable memory-foam cushioned insole with sheepskin/moisture-wicking performance fabric cover. • High-density rubber sole for shock absorption and durability. Great exchanges process. Keep it up!! Great comfort right out of the box! These are the most comfortable pair of business attire shoes I have ever worn. I went back a week later to get another pair to wear with my khakis and jeans! Not quite as comfortable as previous pair and appears to be showing creases / wear quicker on top. I work in a professional environment. JM shoes are great. If you are ever traveling through Pittsburgh Airport, the female assistant manager is terrific!! This is my 3rd pair! Wear with suits or jeans. When in Europe many cobblestone sidewalks and slippery when wet, but the Branning XC4 is perfect. I have solid footing, always dry even in rain and holds its great look. Bought these as a quick, professional looking slip-on shoe. They did not disappoint! Very comfortable and stylish shoe at an affordable price. Great looking shoe, with jeans or dress pants. They fit great and are comfortable. Very easy to put on and take off. I'm completely satisfied.